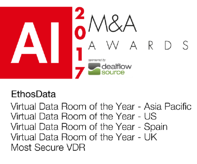 Nominated and selected by the industry experts, the Acquisition International M&A Awards and Business Excellence Awards celebrate dedication, skill and outstanding results from individuals, teams and firms across the corporate world for delivering an exceptional service over the last 12 months. The awards reflect our continued commitment to make our client's experience simple, fast, secure and easy in using a Virtual Dataroom. 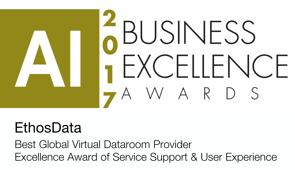 The last 12 months have been very important for EthosData: our team has grown, we have launched our new protection scheme with more capabilities to offer to our clients and we have also launched our interactive Customer Help Portal; no surprise we have been awarded with “Excellence Award for Service Support & User Experience 2017”. All of the awards are given to commend those most deserving for exceptional service over the last 12 months. Winning multiple awards in key markets like the US, UK, Spain and Asia Pacific is a reflection of our effort to simplify transactions not with just the technology alone but with our strong local presence. Accolades like these make us eager to keep growing and provide a superior service to our clients - EthosData simplifies your transaction!